Attention: To administrate report templates you should be InLoox admin or you will need the permission “Create and edit report templates”. For more information on user permissions see also “Set user permissions”. Open Outlook and click on Home in the upper left corner. Select InLoox PM Options from the list. A new window will open. Select Reports >> Templates on the left side of the window. An overview of the report templates will be shown. 1. To create a new report template, open the InLoox options and click on Reports >> Templates. 2. Click on New and another window is going to open. Choose between Inloox 9 and older InLoox versions. InLoox 9 provides you with a new version of the report designer. You can still create and edit reports from InLoox 6, 7, 8 but this is going to change in future InLoox versions. Define from which areas of a project you want to have access to this report template. 4. Afterwards click on OK to close the window and to save your settings. 5. Now the report designer is going to open. There you can design the new template individually. For more information on how to use the report designer, see “InLoox report designer”. When you have finished, click on Apply in the InLoox options, to save your changes. You can change the name of the template. When you have finished, click on OK and the window is going to close. Back to the InLoox options click on Apply to save your changes. To change the content of an already existing report template, select the template in the overview and click on Design. The InLoox report designer is going to open. For more information on how to use the report designer, see “InLoox report designer”. When you have finished, click on Apply in the InLoox options, to save your changes. To delete a report template, select the template in the overview and click on Delete. 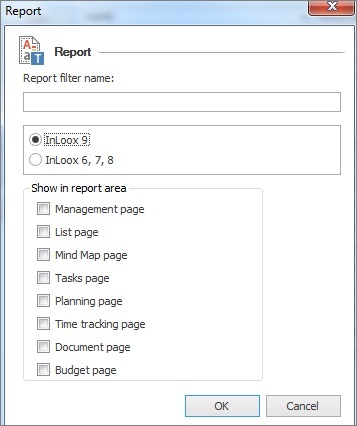 To save a report template on your computer, select the template in the overview and click on Export. Afterwards, you can choose the storage location and then click on Save. When you have finished, click on Apply in the InLoox options, to save your changes. 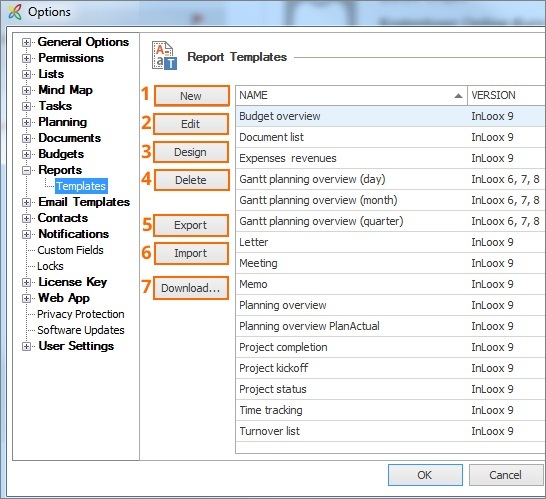 To import a report templates which is saved on your computer, click on Import and select the template from your computer. Afterwards, click on Open. When you have finished, click on Apply in the InLoox options, to save your changes. Click on Download in the InLoox options and the InLoox website is going to open. There click on Templates and select the English version of the report templates. A zip-file will be downloaded and saved on your computer in the download folder. Open this folder by using the windows explorer and double-click on the zip-file to open it. Copy the templates and save them to another place on your computer. Return to the InLoox options >> Reports >> Templates and click on Import. Select one of the saved templates from your computer and click on Save. Proceed like this for all other templates. When you have finished, click on Apply in the InLoox options, to save your changes. Manage report templates • Copyright 1999-2019 © InLoox, Inc. All rights reserved.